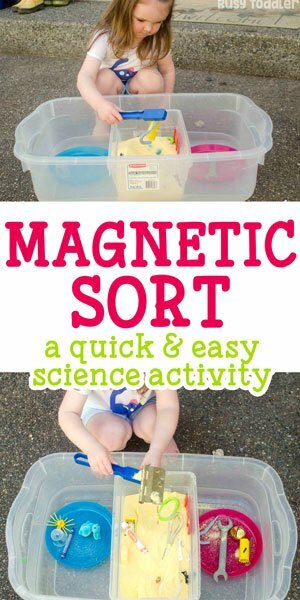 Try this magnetic sorting activity for loads of science fun! 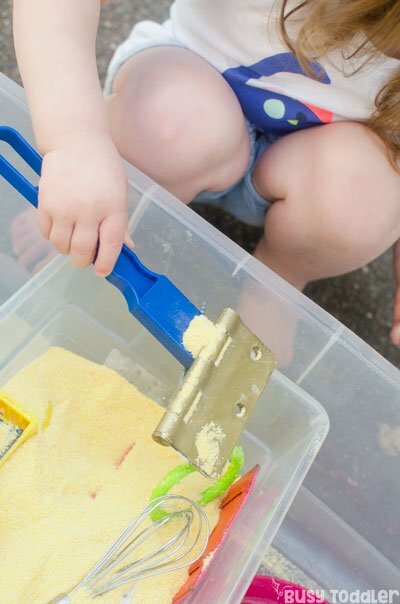 Seriously, think about “magnetic” from the eyes of a toddler: this seemingly ordinary tool can somehow attach to other items and carry them from one place to another. What about that doesn’t scream magic to you? 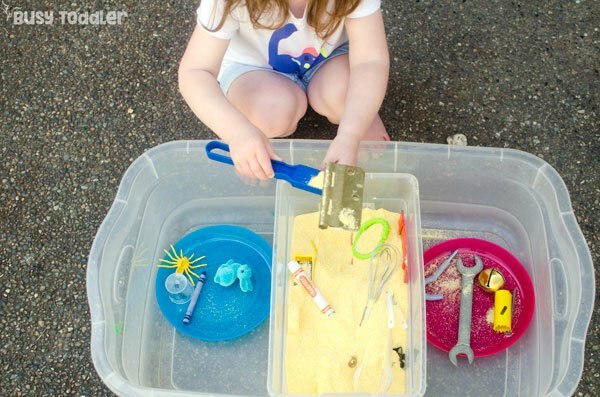 Magnets are magic which makes them the perfect toddler activity. Warning: small magnets are very dangerous for toddlers. In this activity, I am using large magnets that are not “swallow-able”. Make sure to use good judgment and supervision. Teaching toddlers about magnets is not hard. While the concept of “magnetism” is difficult to grasp, understanding when something is magnetic or not magnetic is easy. You can “feel” it. I love using magnets with toddlers because it’s a tactile science that they can touch and interact with. It’s perfect. Which is why I introduce magnets early to my kids. My daughter is 29 months old and has been playing “kinetic” since she was 25 months old. Kinetic is her word for magnetic. My son called it “maymetic” at this age – it’s too cute not to mention. Mom swoon. Step One: introduce a magnet and what it can do. 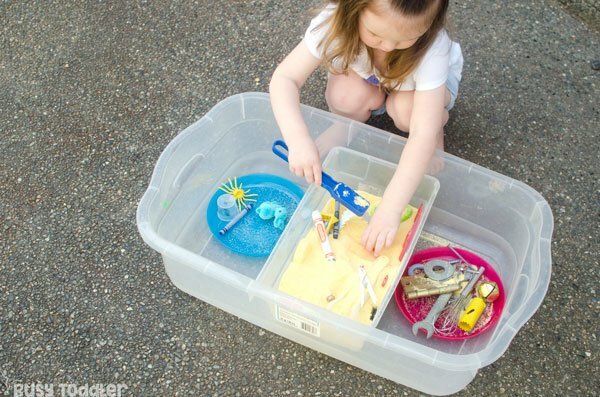 Take your child around the house and let them feel what it means when something is magnetic. To feel the pull of the magnet on the magnetic object. Go together – door hinges, face plates, refrigerators – touch them and learn about magnetic. 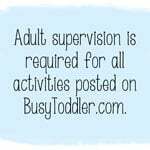 My goal for this activity was to give my daughter a chance to sort in a fun way. 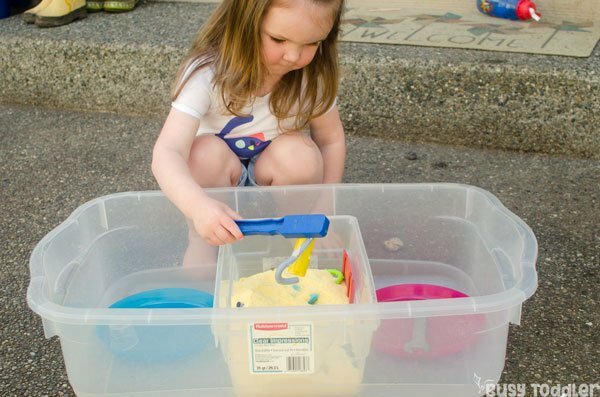 Sorting can often fall onto color – “sort these toys by colors”. But sorting is so much more! Sorting is classifying, critical thinking, and looking at a set of objects and finding the common attributes. 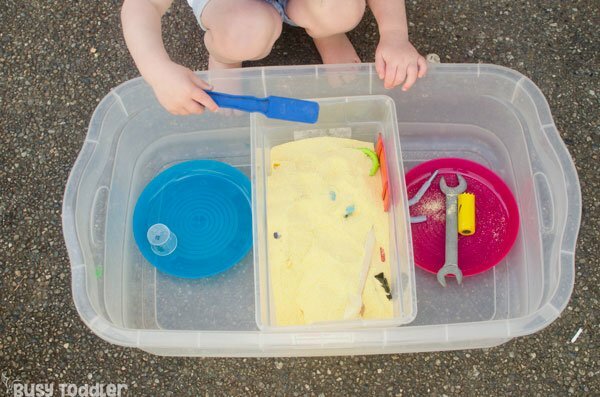 Sorting is a big deal for toddlers. Start with your own magnetic hunt! 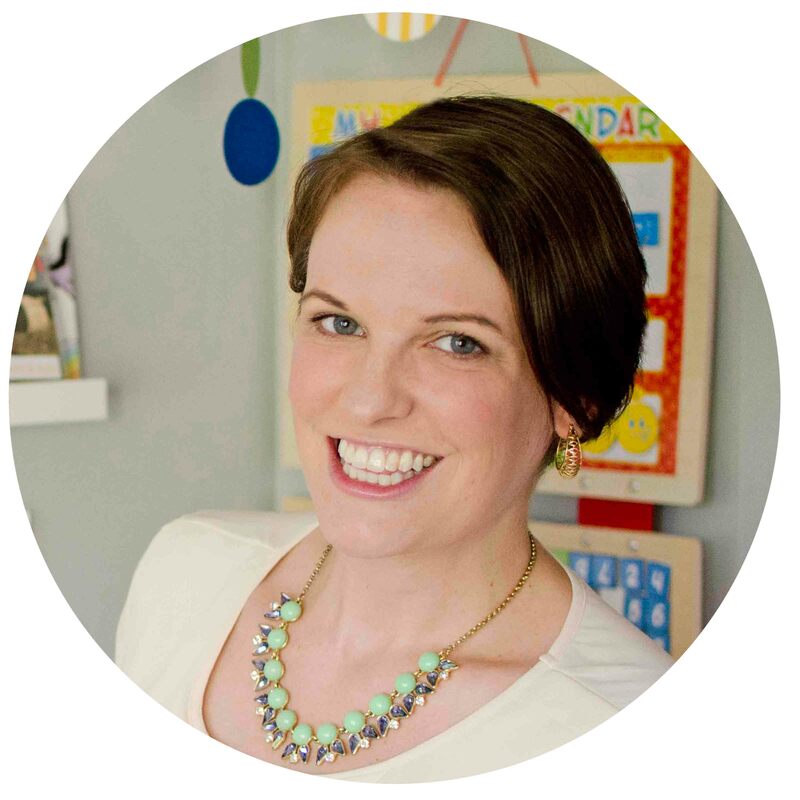 Start by collecting magnetic and not magnetic items for your child to sort. I usually start in the garage, circle through the kitchen and into a random toy bin. 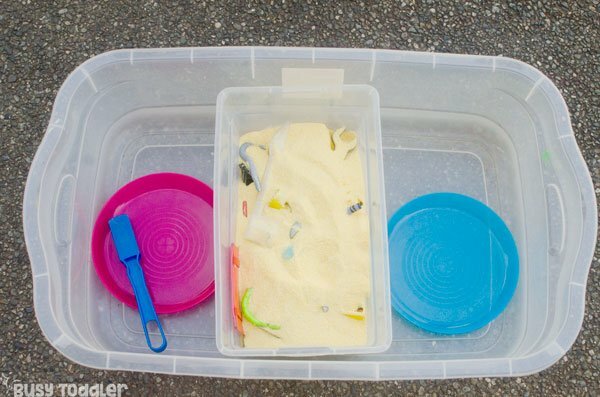 Place all the objects in a small storage container and bury them with corn meal or rice – something to dig through. Next to the container, place two plates: magnetic and not magnetic. This gives somewhere for your child to sort “into”. 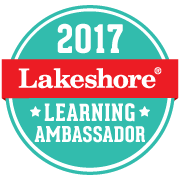 It defines the learning space. Time to start magnetic sorting! I handed my 29 month old a magnetic wand and told her to start sorting. She loved this! The thrill of finding the magnetic items was a giggle every time. We even practiced “predicting” – guessing if an item is magnetic before testing it. What a perfect science activity. 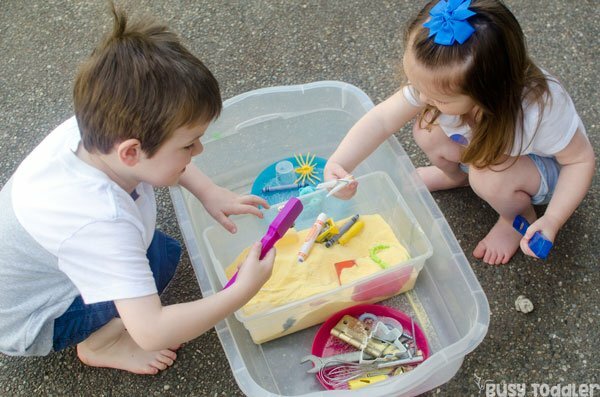 This activity is just great for toddlers: part science, part sensory, part math. You can’t beat it! Even my 4 year old got in on this fun and who can blame him? 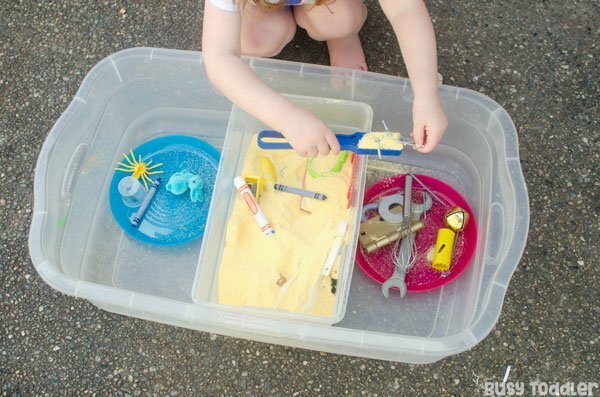 Playing with magnets is an awesome toddler activity. It’s not everyday you get to play with something so magical! 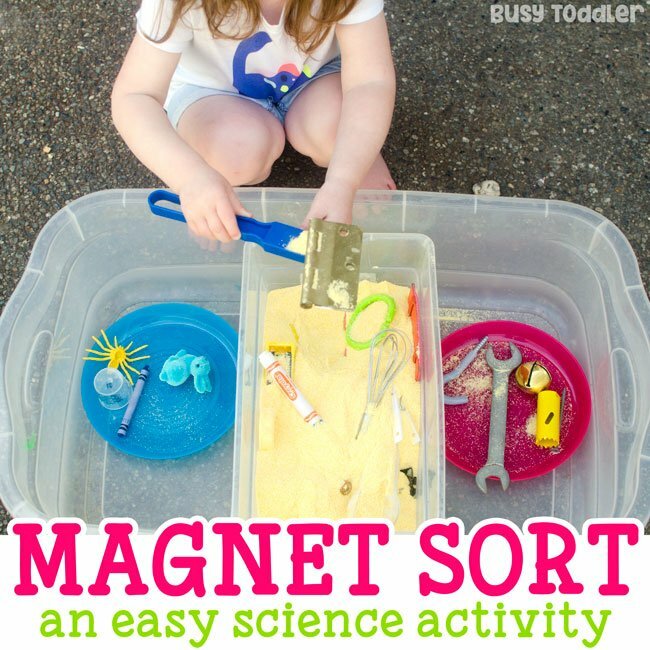 Will you try magnetic sorting at your house?